Border Town (SLICE Agency Book 1) - Kindle edition by Louisa Bacio. Romance Kindle eBooks @ Amazon.com. First get a load of that cover. NUM! Second I’ve read and loved several of this authors works and this is no different. This book has it all a fun love story and a scary mystery and a shocking twist at the end that gave me nightmares (but then again I am a wuss when it comes to the creepy and scary). Lucia is all about home and family and Shaw never had that but when he sees it he discovers that he just might not be able to live without it. This book is perfect for this season and if a wuss like me can enjoy it I know you braver souls will definitely get a kick out of it. 4.0 out of 5 starsJuicy mystery/romance series! A good start to what looks like a juicy family mystery/suspense/romance series! Chupacabra? Shaw doesn't think so, but he hauled his team out to a farm on the border to check out what might be a wild goose chase. Lucia has lived with a beast who attacks her livestock every seven years, and she's determined to finally get to the bottom of it all. The heat between Shaw and Lucia is smoking, and there's a lovely twist at the end that will have you waiting impatiently for the next book in the series. Once I started reading Border Town by Louisa Bacio, I couldn’t put it down. Her storytelling and writing skill drew me in and wouldn’t let go. I’ve read several books by this author and Border Town ranks as one of her best yet. When the heroine, Lucia, contacts a government agency specializing in hunting and fighting paranormal evil, she is met with skepticism. But when the hero, Shaw, and his team arrive unexpectedly at her family farm, they become believers. This story has something for everyone: suspense, humor, romance, and a touch of unexpected horror. 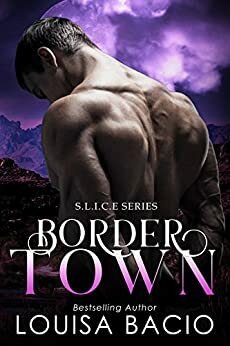 Border Town is the beginning of the S.L.I.C.E series and I look forward to reading more. What caught my interest in this one was the title with that agency. Once I started though Lucia will catch it with her wit and determination especially when a mysterious element comes close to home. Reaching out for a bit of help and when talking to Shaw you come away wanting to slap him the sparks will also be there. When him and the guys come along you sit back knowing it has really begin with the characters really bringing it all to life. 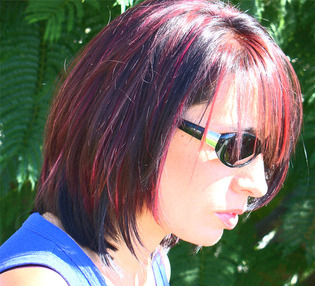 It was always on the edges but the hunt and chase will pull you to the edge and the heat will throw you back. Even though only fragments come out what they are chasing and looking for you are hooked already to this series. Sneaky author too ensuring we stay right here with the ending she traps us to them. What really attracted me to this story is just how strong of a character the heroine is, Lucia is basically running the family farm, while also taking care of her sister. Shaw is the agent that comes to investigate, he and Lucia have an instant attraction as they investigate the mystery of farm animals dying in abnormal ways. At first he does not believe her, but as time goes by, he begins to see what she is seeing and it definitely is unexplainable. And it’s also around this time that they give in to their attraction and find that they are what each other has been looking for. I come from a Hispanic background and let me tell you that the Chupacabra is definitely something that is still being talked about. But…that ending, whoa, that will make for the next part of the series something to really look forward to…I highly recommend this story. This was my first book by this author. When I first read the description I really didn't think I would like it. Then I started reading it. This book sucked me in from the first page. It's a fun and kinda scary book. It almost made me convinced chupacabras are real. 5.0 out of 5 starsAnother amazing book from this amazing author. I have read several books from this author and I have loved them all, this one is no different, I could not put it down it was so good. If you have not tried this author out, please do so, you will not regret it.